CARPENTER/ACROBAT CONTROL - "We kill what bugs you!" Carpenter ants are very common in our area of Texas. In fact almost every property has or has had an infestation on it somewhere. Carpenter ants can be found in trees, landscaping, fences, sheds, decks, homes, and many other places. They prefer moist or decayed wood to start there colonies in and will usually expand into more sound wood as the colony grows in size. Carpenter ants don't need to eat the wood they infest like a termite, but can be very destructive over time if not treated properly. Correcting conducive areas on or around your home as well as regular pest treatments is the best way to prevent Carpenter Ants. If you already have them, then we know what to do. We inspect and track down the colony to be treated locally and minimize the pesticide used. With a 90 day warranty for the entire structure treated we are sure to solve your problems. Carpenter ants are also covered under the Quarterly and Monthly Pest Control Programs. Acrobat ants are also common in this part of Texas. They can be found traveling in large numbers over paths to and from food sources throughout all hours of the day. Carpenter ants usually forage in their own direction in much lower numbers and tend to only forage at night. Acrobat ants also infest wood and can be destructive to property as well. 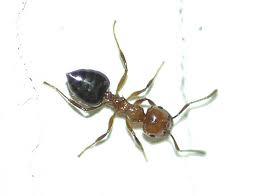 Acrobat ants are generally smaller than Carpenter ants and have a distinctive heart shape rear end. 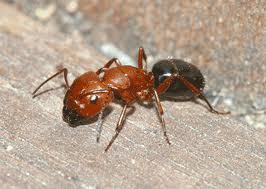 Acrobat ants are prevented and treated in the same manner as Carpenter ants and require colony location for proper treatment. This treatment also comes with a 90 day warranty. 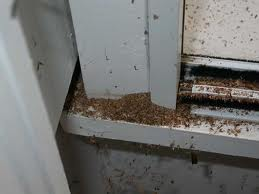 Acrobat ants are also covered under the Quarterly and Monthly Pest Control Programs. How do I know if I have Carpenter or Acrobat ants? There are a few ways to tell. If its Acrobat ants then you can usually expect to see them foraging heavily in trails during the day. Also look for the heart shaped rear end. Carpenter ants tend to be larger and less in numbers. They do not all follow the same trail either, instead you will see just a few walking around. They both will also leave what is called "frass" below or outside the entrance/exit hole that leads to the nest. Frass consist of pieces of insulation, wood shavings, or dead ant parts. They throw this material out of the colony as they make the galleries larger. Swarming ants found on the structure in the spring in another sign of an infestation. If you're not sure what kind of ant you have, give us a call and we can help you form start to finish.